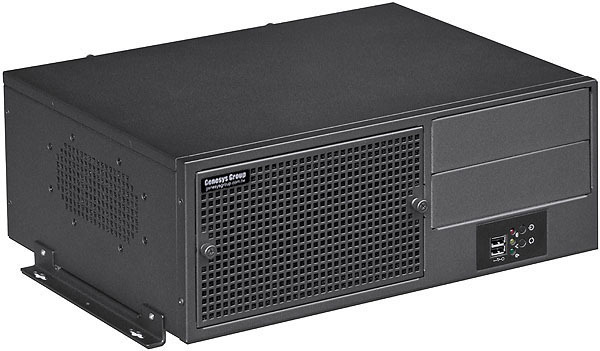 The features of this new Mini-ITX chassis are compliant with 4G LTE or high speed WiFi networks and cloud transmission as well as NAS storage application for enterprises and Soho purpose. It can support maximum 8 × 2.5" hotswap drives or 3 × 3.5" hotswap drives, and additionally two more 2.5" internal HDD installable inside. This chassis mechanism uses very durable and high end SECC 1.0mm thickness, and the optional wall mount bracket can be installed in harsh industrial environment very well. This chassis also designed with quick assembly and screwless air dust-proof shield to keep away from the dust into the system. Cooling system also equipped with two silent 80mmx25mm fans as well as anti-vibration function. Also it supports dual slot expansion card such as high end graphic card with this chassis.